Creston’s mountain property will entice you with opportunities to socialize, entertain, or spend quiet time alone or with loved ones enjoying the spectacular surroundings. The Community Center was designed to be an extension of your own living space, a magnificently executed area in which to socialize and relax. Its cozy library nook, indoor and outdoor stone fireplaces, spacious seating, and well appointed service kitchen will pamper you. And, at 3,100 feet, 360 degrees of spectacular long-range mountain views from the summit of the mountain will enchant and inspire you. 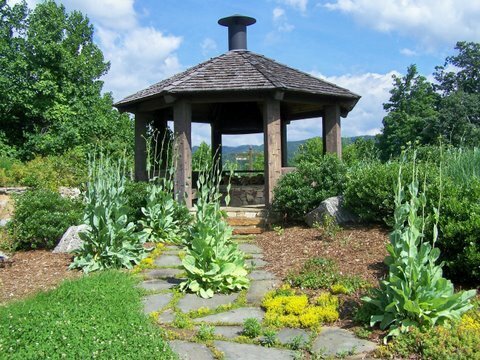 The Gazebo at the roundabout is a comfortable, casual gathering place. 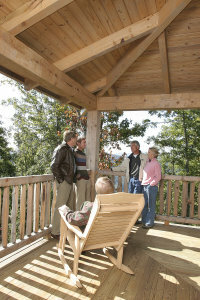 Situated at 2400 feet, its timber frame shelter will accommodate all your friends and family. More than once the mountains have echoed with laughter and old songs around crackling embers in the fire pit. Triple Falls Sanctuary is Creston’s secret garden; a 350 acre preserve of forest, streams, and waterfalls that is literally the soul of this mountain community. A gentle trail allows property owners’ access to the park by foot or vehicle. Arriving in the Sanctuary is magical. A foot path leads from the parking area across a creek to Falls Camp. The sound of rushing water is immediately recognizable as you approach the primitive camp area. A covered rustic structure named the Moonshine cabin lies at the edge of a river complete with a large stone fire pit and plenty of stacked firewood. Three waterfalls surround the camp area with a viewing platform below Allison falls. This powerful confluence of water creates the left fork of the Catawba River. The area beckons for a good read, picnic, and is conducive to spending time together immersed in nature. Extra care has been taken to leave the area as natural and undisturbed as possible. 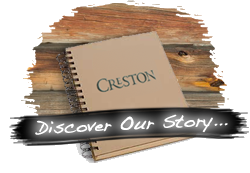 The area is rare and honored by the residents of Creston Mountain Community.